See, now THAT'S how you correctly post a video or photo without comment or context. Michael H. Profession: Director, directed and written by Yves Montmayeur. (Austria, France) – World Premiere. Over the past twenty-five years, director Michael Haneke has established himself as a towering figure in modern cinema whose rigorous focus on the craft of filmmaking has produced works of profound artistry. This career-spanning documentary (gives unprecedented access and) covers the body of Haneke’s work, offering insight into his creative process through on-set footage and interviews with the man himself and collaborators including Emmanuelle Riva, Isabelle Huppert and Juliette Binoche. In French, German with subtitles. Michael Haneke usually doesn't let more than a couple years pass between films, and it would appear that the director is gearing up his next effort, his first feature since 2012's Palme d'Or and Oscar winning "Amour." And it would find the filmmaker taking on some unexpected subject matter. Film Comment reports that Haneke will shoot "Flashmob" this summer, with the story partially set in the U.S. And yes, the movie is about that exact subject. The story will follow a group of characters who connect through the internet and are brought together by the titular event at the end, while the movie thematically exploring the relationship between media and reality. And while there doesn't seem to be much other news on this project out there at the moment, financing started coming together a few years ago when Haneke was shooting "Amour," with the Austrian Film Institute kicking in some funds. No word yet on casting, but we presume if lensing happens in the next few months, we'll see Haneke back at Cannes in 2015. We're now over two years since Michael Haneke took the Palme d'Or and won an Oscar for "Amour," and the director is taking his time getting back behind the camera. Earlier this year, it was reported that he was planning to shoot his next picture, "Flashmob," this summer. But it looks like those plans have shifted as the filmmaker seems to still be in the process of figuring out exactly how he wants to present his tale. Haneke was recently in Copenhagen where he gave a masterclass and Montages reports the director stated "Flashmob" would likely not shoot this summer. Part of the reason is that he's apparently waiting for a certain, unnamed actress to take a role in the film ("I'm waiting in line," he said) and the other is that he's still not decided on the visual/tonal aesthetic he wants to use. In short, it seems all very early at the moment. "I too often say too much about the future of my projects, and I've never managed to keep my promises in advance," Haneke stated. And certainly, we can see why Haneke wants to ensure that all the elements are just so, as the premise for "Flashmob" is a bit different than his usual fare. The story will follow a group of characters who connect through the internet and are brought together by the titular event at the end, while the movie thematically exploring the relationship between media and reality. Wouldn’t you say that it can be valuable—and not so easy—to write about your material possessions and sexual urges in a way that brings the world of our experience to life? Maybe that’s our challenge, in New York or Vienna or Berlin. It seems to me that in the context of your oeuvre, Amour marks a slight shift of focus. If previously your films dealt with problems of communication and cruelty, then Amour is surprisingly tender in comparison, displaying some- thing that’s akin even to genuine understanding and love. And even so, we’ve got problems of communication—between father and daughter. But in the married couple I did set out to construct an ideal case. They truly love each other and have respected each other and remained close for over fifty years. That, of course, isn’t very common, but I needed that to raise the stakes in the plot. It was important that this be a couple that has you say, Wow, I would love to have that, too. That was simply necessary from a dramaturgic standpoint. Had I set the film in a social context lacking such financial security, it would’ve been an altogether different film. Amour’s protagonists still take part and pleasure in high culture. They are comfortable, they go to concerts with their friends. I wanted this film to speak about the end of life without being a social drama. Because no matter how rich and cultured you are, if you are sick and nearing death, you’re not going to be having such an amazing time—that was my point of departure. I wanted to ask, How do you deal with the suffering of the person you love? That is an unbearable situation. The last we heard about Michael Haneke's long-developing "Flashmob," he was waiting for an unnamed actress' schedule to clear up so he could make his movie about a group of characters who connect through the internet and are brought together by the titular event at the end, with the movie thematically exploring the relationship between media and reality. But whether his patience is up, his interest has waned, or whatever other reason, Haneke is moving on. Le Parisien reports that Haneke has dropped "Flashmob," with the director revealing he has been researching his next movie that will take place in France. Of course, what it's about, when it might shoot, or other such details haven't been disclosed, with the filmmaker even refusing to discuss why he's decided not to make "Flashmob." We're clocking on four years since Michael Haneke tore our hearts out with "Amour," and aside from helming an opera performance for television broadcast, all has been quiet in terms of a new film from the director. Over the summer, we learned the director had dropped his long-developing "Flashmob" and was working on a new France-set movie. Details at that time were scarce, but cinephiles have a holiday-season treat as much more has been revealed about what Haneke is brewing next. French media reports that Haneke is reteaming with Isabelle Huppert ("Amour," "Time Of The Wolf," "The Piano Teacher") and Jean-Louis Trintignant ("Amour") for "Happy End." Exact details are being kept under wraps, but production will take place this spring in Calais, and while the story will involve the migrant crisis in Europe, producers stress it is only an element of the plot, not the narrative focus. For years, fans of Michael Haneke have hit their nearest arthouse to experience his perverse, cold-blooded, darkly humorous pictures. Now, the filmmaker is joining the throngs who are headed to television, for a project that truly sounds unlike anything he’s done before. If some have dismissed “Happy End” for playing the hits, so to speak, well Haneke has something truly original — at least for him — on the horizon. The director has teamed with FremantleMedia’s UFA Fiction to create his first ever TV series, “Kelvin’s Book.” The ten-part series will be in English, is set in a dystopian world, and will tell the adventurous story of a group of young people in a not too distant future. During a flight, they are forced to make an emergency landing outside of their home and are confronted with the actual face of their home country for the first time. It sounds a bit like the premise for your standard YA novel mixed with “Lost,” but we’re sure in Haneke’s hands it’ll be something utterly singular. Even more, it looks like the filmmaker isn’t done commenting on the current fascination with digital technology. However, there are some big questions that still need to be answered regarding the project. Who’s writing the script? And is Haneke just creating the project and sticking around as an executive producer, or will he be rolling up his sleeves to direct some or all of the episodes? 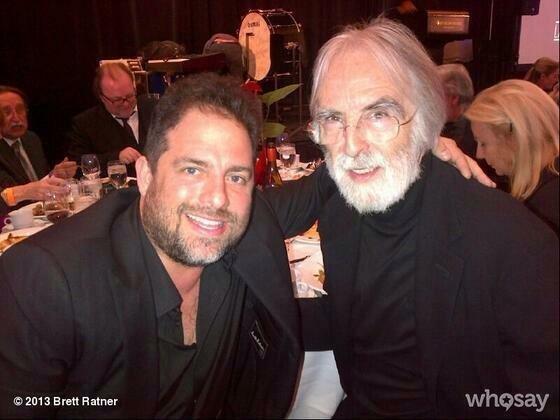 At any rate, Haneke is pretty excited to be making something on a bigger canvas. “After ten TV-movies and twelve films, I wanted to tell a longer story for once,” he said.